I hope that everyone has a great New Year! I am really excited for 2010 and what it will bring for the Pryor Mountain Wild Horses. Our newsletter describes some of our proposed projects for 2010, and we’ll of course be carrying out and expanding our existing programs and projects as well. Since its creation, the Pryor Mountain Wild Horse Range has played an integral role in influencing the protection and management of our Nation’s wild horses. Though 2009 presented unique and difficult challenges, I believe that the PMWHR still has the great potential to be influential by being an example of a successfully managed wild horse area. I also believe that the PMWMC’s local advocacy and unique projects will greatly aid in achieving this goal. The PMWMC is a small 501(c)(3) non-profit organization that relies on the generous contributions of supporters. I invite you to join us by making a gift today. Gifts can be made by mailing in the form from our newsletter or online through our website. Thank you for all of your great support! I was very excited to get to go to the Monero Mustangs wild horse sanctuary yesterday. Photographer Lynne Pomeranz also was able to go too, so that was great as she played a big role in getting a home for Stiles there. We got to the sanctuary in the morning and got to see Stiles right away. He’s still in a pen now as he gets acclimated to the area and gets to become acquainted with the other horses there. His pen is pretty nice for him; it is a pretty good size and has nice trees for shelter. He was shy when we approached at first, he moved back into the trees to watch us while he ate snow. I thought it was funny he ate snow even though they keep a water trough in there thawed for him. Having liquid water this time of year is something he really isn’t familiar with as it is so rare in the Pryors. He eventually came out to eat some more hay. They told me that Stiles is funny about always eating every last bit of hay he has available. Stiles has interaction with the other horses at the sanctuary. Next door to him is a pen with two younger males. I think Stiles would look pretty good running with the sorrel looking horse. It sounds like they annoy him sometimes, though; and he has apparently shown them who is the dominant stallion of the three. Some of the other horses in the area that were feeding also came to visit him, though he was a little shy again. I really liked the little dun pinto there. We also spent time with the other horses who were nearby feeding. Most of them were down from Stiles. This time of year, many of the horses come in and stay in this end of the sanctuary while they get supplemental feed. In other seasons, all of these harems are spread out around the area. While looking through this area, I caught a glimpse of a horse. They immediately knew who it was and we soon found the rest of the harem the mare belongs to. This harem is led by the black stallion Malpais, who came from the Jicarilla Wild Horse Territory. They apparently tend to stay out here unlike the many horses hanging out closer to the supplemental feeding area. After a few minutes, the sorrel mare we’d originally spotted came back to them. This harem had a foal this year. This little buckskin’s name is Fantasma, and he is a pretty good looking little colt! We also were able to see many of the elk that are on the sanctuary right now. This was pretty fun too. I’d highly recommend that you go to the site of the Monero Mustangs to learn more about the organization. I think that this is a program that is well worth supporting. I think that this is an especially good time of year to provide the sanctuary with support as the hay used for supplemental feed can’t be cheap for them. I had a great time out there, and I can’t wait to come back during the other seasons to spend more time there. I always like to have as complete of picture as possible of the herd at the end of the year. I was able to be on the range yesterday and last Thursday, and I was able to see 97 horses on these trips. Below are some of the things I found on these trips. I was also very happy to see Exhilaration last week. The reason why I was so happy to see him is worthy of a blog post itself. I’ll just say it involved open gates and/or down fence combined with Exhilaration’s discovery of some nearby domestic mares. The black mare Pococeno had been a priority horse for me since I found her missing from White Cloud’s harem at the end of October. Yesterday I found her with Prince. I know she wasn’t with Prince right after going missing from White Cloud, so I’m very curious to know what kind of adventures she was on. My best guess is that she was with Morning Star during this time as he is the only stallion I couldn’t find during her absence. It was like old times yesterday, though, with Prince, Ireland, and Pococeno being near Custer, Winnemucca, and Irial while Littlefoot was close behind. Yesterday we also spent a good amount of time exploring Lower Sykes to find horses. I was able to solve another mystery there. This seems to possibly be related to the Exhilaration incident, but Admiral was not with his harem for a short while. During this time, the young filly Halo disappeared. I found her yesterday with Merlin. Her little sister Icara was also there. Below Merlin was Sitting Bull’s harem. Sitting Bull’s foal is getting big, and I think he’s a lot of fun. Further in was Seattle and his harem. Seattle kept a good eye on me while I was seeing how everyone was looking. His black sons were all lined up. I think they are a pretty good looking trio together. Everyone else looked great as well. Just down the hill from them were White Cloud and Bolder’s harems together. As I’ve mentioned before, I think winter is fun as you can see mountain horses and Dryhead horses in close proximity due to their overlapping winter ranges. If you do some raw counting or identification of the horses in the above photograph, you’ll notice that there is a missing horse here. This is White Cloud’s two year old daughter; she is currently up on Sykes with Coronado. As you can see, there’s snow on the ground here; and the horses are spread out across the range. With the above observations, there are no missing adults; and no foals have disappeared lately. As we go into winter, I think the horses look to be in good shape; and there is a lot of great forage for them. This will likely be my last horse-related blog post of this very significant year for the herd. I am really looking forward to seeing what next year brings for the horses. These are the major water sources on the PMWHR. At the top are the most familiar water sources. These are only available in the summer, and Krueger’s Pond is the only one that tends to have reliable water available through the warm seasons. The others small ponds up there can have a little water available later, though, depending on summer precipitation patterns. In the middle of the PMWHR are the Burnt Timber and Sykes Ridge water developments. The Burnt Timber development was an old water catchment that had been in disrepair but was upgraded with two new guzzlers by the BLM in 2007. The Sykes Ridge development actually consists of a catchment tank that feeds into a trough. The trough must be manually filled up with water through a spigot there. Those of us who know where it is try to keep some water in there, but it’s not an optimal situation. The other water sources are in the lowlands. Layout Creek is a primary water source for the horses living in and around Mustang Flats. The Park Service actually has a watering area in the creek built for the horses, but they’ll often be seen watering at other areas along the creek as well. Down south is Crooked Creek Bay; this is where the Park Service entrance to the PMWHR is. 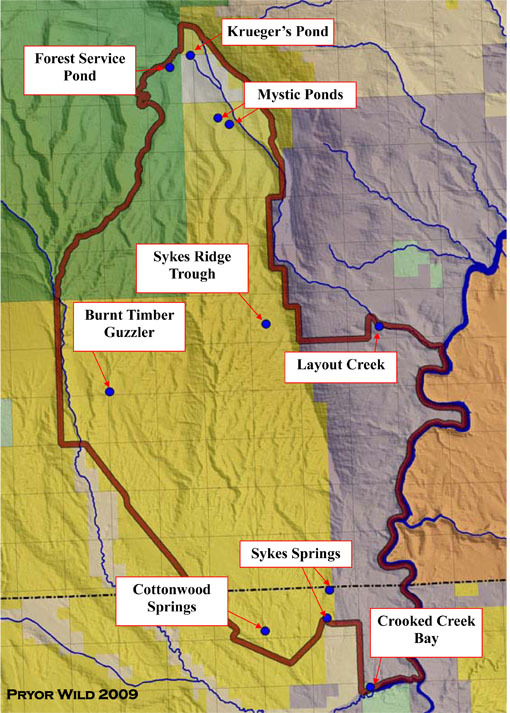 West of there are Sykes Springs and Cottonwood Springs, these are important watering areas for the Dryhead horses living in the lower Sykes Ridge area. Notice that the best available water is in the little area at the top of the PMWHR as well as in the lower end of the PMWHR. The mid-slope, which is the largest area of the PMWHR, is lacking in water. These areas get use when there is snow on the ground, but they aren’t getting as much use as they could while the upper and lower elevation areas receive too much use. 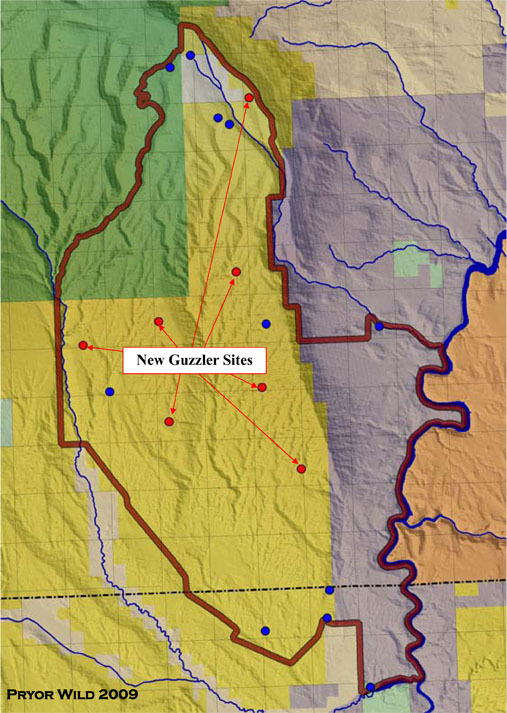 In response to this pattern, the BLM outlined plans in the new PMWHR Herd Management Area Plan (HMAP) to make the grazing distribution of the horses more uniform by making water sources more uniform. The plan was released in May, but I understand legal action prevented the projects, such as the water developments, from being installed this year. However, in talking with the BLM recently, I was happy to learn that there are plans to install the developments next spring. As can be seen, these new water developments are concentrated largely in the mid-slope. Again, this is so that the horses don’t concentrate in small areas but instead spread out. Recall back to an earlier post in the Management Series that discussed the calculation of Appropriate Management Level. AML takes grazing into consideration, and having more uniform grazing can allow for an increase in AML. So what do these guzzlers look like? The BLM’s got some purchased, and I went and took some photographs of them. Below are 3 guzzlers together. Each site will have one to two guzzlers. At the end of them is the area where water is available for drinking. This area is constructed so virtually any wildlife can safely get to water. These guzzlers will definitely benefit the other wildlife of the PMWHR along with the wild horses; Bighorn Sheep are sometimes spotted at the Burnt Timber guzzler. The guzzlers are pretty big with a capacity of 1800 gallons. They are also very resilient and require very little maintenance. This is what they look like inside. As I mentioned above, the Burnt Timber water development was upgraded with guzzlers a couple years ago. It gives an idea of what they look like installed, though the new ones will be less conspicuous as they will have new catchment aprons; the one below still has its original one. So in the back you can see the apron, it is the black square on the ground. Water collects there and then runs down to the two guzzlers through underground pipes. Notice how when installed, the guzzlers are buried so that the watering area is just above ground. We often associate management with actions that are directly related to the wild horses, like roundups. However, range improvement projects, like the development of new water sources, are another method of wild horse management. These types of projects focus on maximizing the population size that the land can carry. Still, though, the land can only carry so many horses; and so actions that focus on population management are sometimes needed. In the next posts in the management series, we’ll start talking about population management strategies. I’m frequently heard saying that it’s only fair to scrutinize a management strategy’s effects on the horses if we ask the same questions of the alternatives. With that said, I think it would be useful if some of the questions you may have are shared with me, so that we can go through management strategies by comparing their effects. Please write a comment here with any questions you may be able to think of, or feel free to use the PMWMC contact form by clicking here. These are very relevant topics right now, and I think they are well worth understanding.